The piano is probably the most beloved instrument in the world. For this reason, we thought it would be a good idea to make a list of the 10 best digital pianos under $500, to make it easier for all aspiring musicians to find a perfect instrument for them that doesn’t break the bank. Got more to spend? Try a digital piano for less than $1000. There are many reasons why somebody would like to buy a digital piano instead of an acoustic piano. Convenience is the biggest reason, it just takes a lot less space, it’s easy to move and you don’t have to tune it. You can also turn the sound down or even wear headphones so that nobody gets disturbed by your playing. If that isn't an issue, check out our review of the top upright pianos. Another good reason to buy an 88key keyboard is that it often has a few extra sounds, with the press of a button it can be turned into a harpsichord, an organ or maybe even strings. A digital piano is also very useful if you want to record your own music, since you can connect it to your computer via MIDI. So there is no question about it- every musician should own a digital piano! 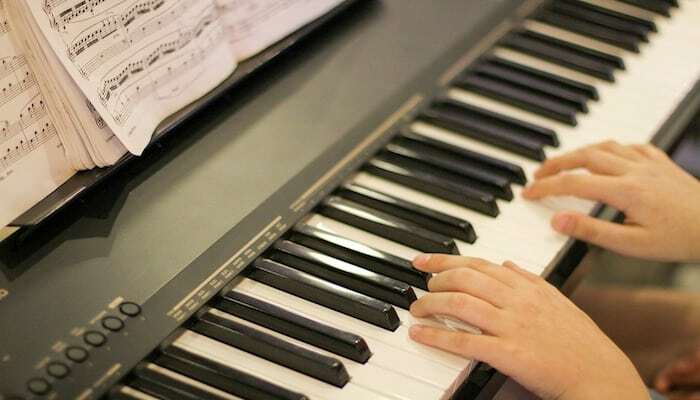 Even if you have another main instrument, it can still be very useful to have a piano, for example to learn music theory more easily or to be able to have somebody accompany you. 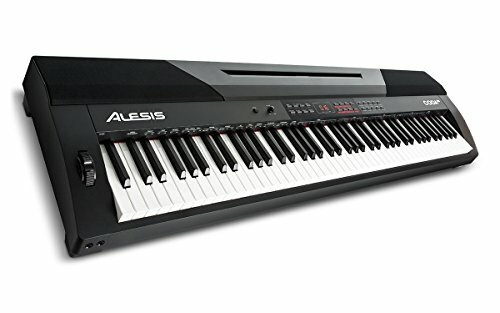 What to Look for When Buying a Digital Piano under $500? What Are Hammer Action Keys? Why Weighted Action Keyboard Keys? Are you ready? Here are ten great electric pianos that we think you should check out! 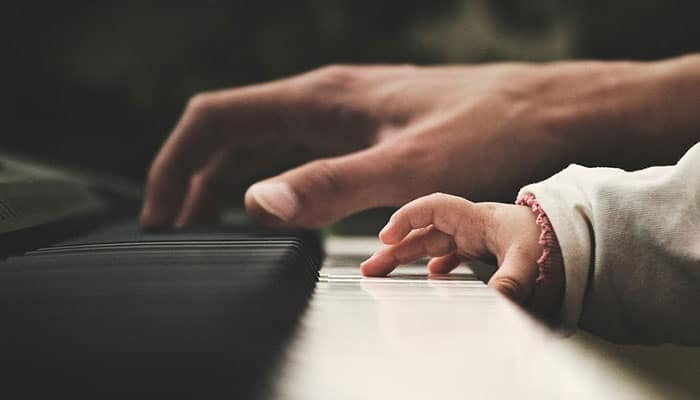 Read carefully through the reviews and watch any YouTube videos mentioned, and you can be sure to find the perfect piano for you! Let’s start with something simple for the musicians that want something basic that still sounds good. The Yamaha P45 weighted action digital piano fits right into that description. It’s very sleek-looking, not many buttons or anything extra really, which not only makes it cheaper, but also slimmer, it doesn’t take up much space, which is always a good thing! Even though it’s simple and affordable it doesn’t look like it. It’s impossible to determine the price just by looking at it, it could easily be mistaken for a more expensive piano. This piano is designed to replicate a grand piano, or portable grand piano, Yamaha has aimed to make your playing experience as similar to the real deal as possible. The keys are weighted action and imitate the feeling of pressing a real key that makes a hammer strike a string. The harder you press, the louder the sound, and the low and high notes are slightly different, bringing life to your music and making it possible to get the ideas from your head to the piano. The sounds are actually really good for what you pay, and there is a small selection of voices, for example two different pianos, organs, strings and harpsichord. If you want to hear this piano being played and hear all the different voices, head over to YouTube and watch this video review. 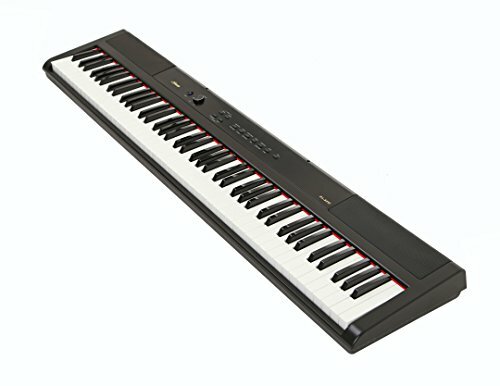 It’s quite long, but definitely worth watching for factors to consider before buying this weighted action digital piano. Why We Liked It - This piano is great for anybody who would really like to have an acoustic piano, but because of space or living in an apartment with neighbors on the other side of the wall, feels like it’s not possible. This piano will give you (almost) the same feeling of playing an acoustic piano, both from the way it feels when you strike a key and the way it sounds. You might have thought the first piano we looked at was OK, but isn’t there anything with more buttons and fun stuff to play around with? 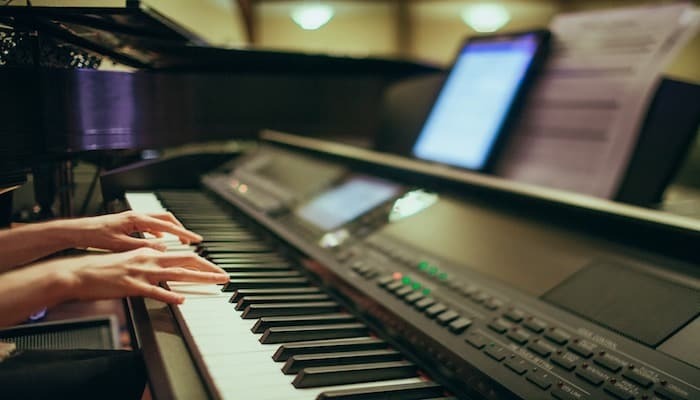 Many pianists like to have the option to change up their sound once in a while, which for some is actually reason enough to have a digital piano instead of on an acoustic one. 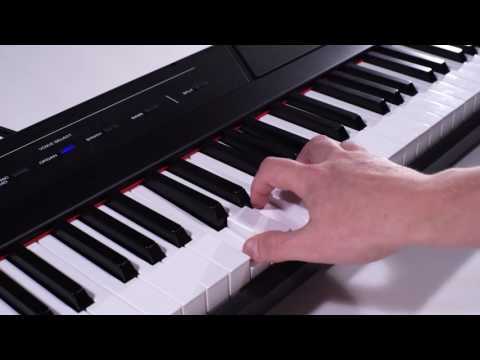 If you identify with this, chances are that you’re going to like Alesis Coda Pro 88key digital piano. It has 20 voices and allows you to split or layer two voices (split mode). This means that if you, for example, want to play strings with your right hand and piano with your left, you can do it! Another good thing with this Alesis Coda Pro 88key digital piano is that it has a teaching mode, so if you have a piano teacher that comes over to your place or even if you are teaching students in your home, you can with the press of a button take the lower end of the keyboard up a couple of octaves so that when you’re sitting to the left of your student, you can demonstrate on the lower keys but get the sound in the right octave. No more leaning over your student to try to reach! The piano has 88 keys and hammer action so that it feels almost as good as playing an acoustic piano, and it has a record mode so it can be a good tool if you like to compose a little bit. There is also a duet mode with 50 accompaniment patterns and 60 preset songs to play along to. You can connect the piano to a computer with MIDI. Why We Liked It - We imagine there are many pianists that could benefit from this piano. It’s very affordable considering what you get for your money. 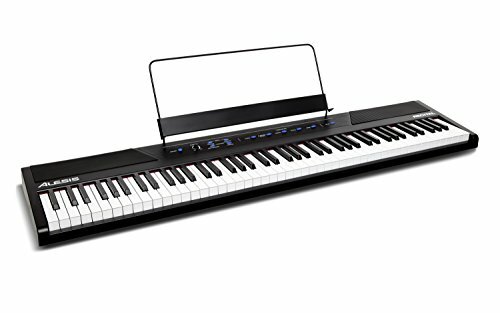 If you teach the piano a little bit on the side and want to be able to split the keyboard so that you can demonstrate the music in the right octave this is a bargain. Beginners as well as intermediate players can have a lot of fun with this piano, and it has got hammer keys action so that it feels like playing an acoustic piano. Alesis are known for making great pianos for beginners! Keyboard beginners might want to checkout these beginner-friendly keyboards. Did you read through the first two reviews, becoming more and more frustrated? Where are all the cool sounds? Are you one of those people that needs at least a couple of hundred voices to choose from in order to be satisfied with a piano? Then look no further, the time has come for your wish to be granted! This digital piano from Yamaha is like a keyboard with the touch of a piano. The Yamaha DGX offers 489 voices to choose from, so no matter what genre you feel like playing you can find the perfect sound for every situation! 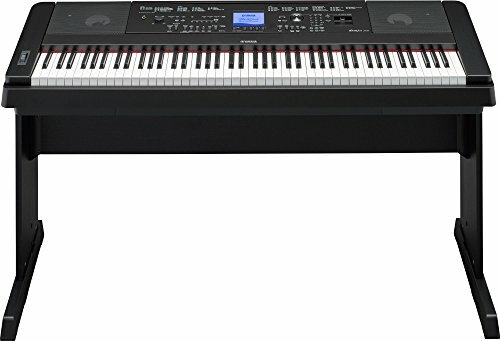 Yamaha digital pianos are best for beginners and usually have only 76 keys instead of 88, but if you are a beginner or have a kid who is a beginner, and you’re not sure if you want to invest a lot of money when you don’t know how long it will be used for, the Yamaha DGX is a safe choice that still provides you with all a beginner needs. 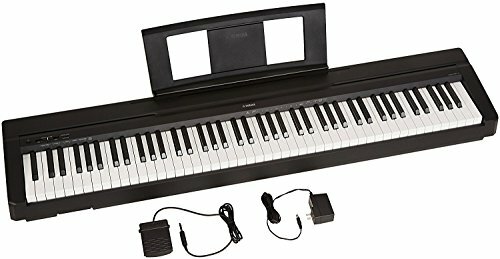 If you want to get a piano to be able to try your hands at some music production this piano works well for that purpose and can be connected via a USB connection to your computer. Why We Liked It - We would recommend these pianos for beginners that just want to find something cheap to get started with. Players who have played for a while will probably not be satisfied with it since the keys aren’t weighted hammer action and it’s not full size keys wise. Next up is an Amazon exclusive piano, namely Yamaha P71. It has 88 weighted keys and contains 10 different sounds. It allows you to layer two voices together so that you can feel like the one-man-band you’ve always wanted to be! Probably the best thing about this piano is that it’s very light and slim, so if you don’t have much room you could actually keep it under your bed or sofa or some other empty space and just put it on a table whenever you want to play. If you want to connect this piano to a computer you can do so via USB, which is great if you want to try a little bit of composing. Why We Liked It - If you’ve always wanted a piano but always found an excuse not to get one; “We don’t have space for one”, “They’re too loud”, “It’s too expensive”, then this is the piano that suddenly takes all the excuses away! 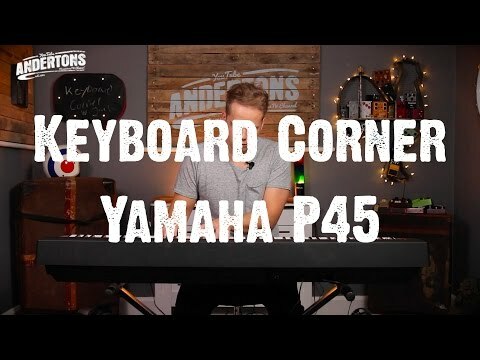 The next piano is very similar to number one on our list, Yamaha P45. The biggest difference between the two is that the P35 only has 32 note polyphony- half of what P45 has! So what is polyphony anyway? Simply put, it’s the number of notes you can play at the same time. So imagine that you press the sustain pedal with your foot and play 32 notes after each other, that’s how many can sound at the same time. Considering this you might realize that the more advanced a pianist is, the better the maximum polyphony he requires. This means that this piano is probably best for beginners that don’t have to worry about stuff like this! The P45 also has better sound, since it’s really an upgrade from P35. So what does this mean? Why would anybody buy the P35 when the P45 is around and is slightly better? Of course, it comes down to the price. The P45 is slightly better, but it’s also slightly more expensive. Why We Liked It - We would recommend that if you like this piano, buy the P45 instead, since it’s an upgraded version of this one. However, if you’re looking to save some money you should probably go on to Amazon and compare the prices. Another piano that is great if you’re looking for more of a hybrid between a digital piano and a keyboard is Yamaha YPG-235. It has 76 keys, so it’s not full-sized, but close enough for many. The keys are not weighted hammer action, so this piano is more suitable for modern music like pop and rock. The fact that this piano has almost 500 different voices, 160 styles of accompaniment that follows along with the chords you play and 30 preset songs makes it ideal for named genres as well, and if you need a musical instrument to record music this is a great option. It connects to your computer via USB connection. The only downside to be aware of is that the power adapter is sold separately. You can either by one or use AA batteries. 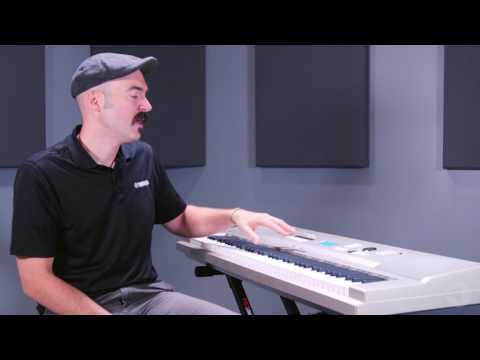 Why We Liked It - This piano/keyboard is perfect for anybody that wants to be able to use many different sounds, for example when producing their own music. This is not the right musical instrument for somebody that plays classical music or somebody who practices a couple of hours every day, but rather somebody who needs to have access to a keyboard for different musical purposes. It is a great keyboard in this price range. 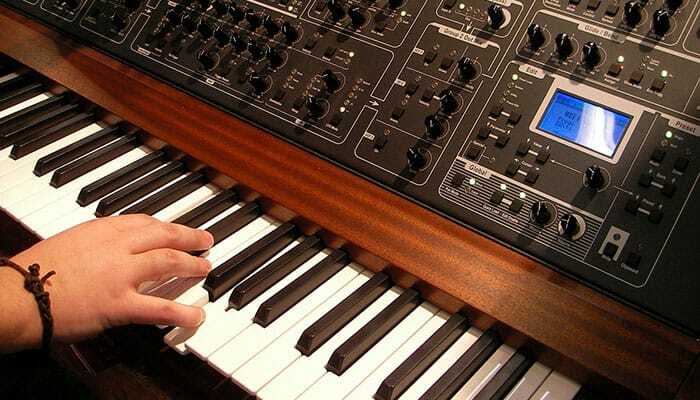 It’s time to take a look at another simple yet outstanding digital piano. Artesia PA-88W is a very light and slim piano that takes up minimal space, which is always nice. It’s easy to use and even though it only has eight voices, you can connect it to Garage band on your iPad to get access to all the sounds in the app which is pretty cool! The digital Grand piano sound is a three-layer sample that makes the tone rich and it sounds as good as you can expect it to at this price point. Why We Liked It - This is the piano to go for if you wish you were able to have an acoustic piano but you need the benefits of a digital one. It sounds good and is easy to use. If you don’t want an abundance of buttons that you have no clue what they are, you will like this piano! 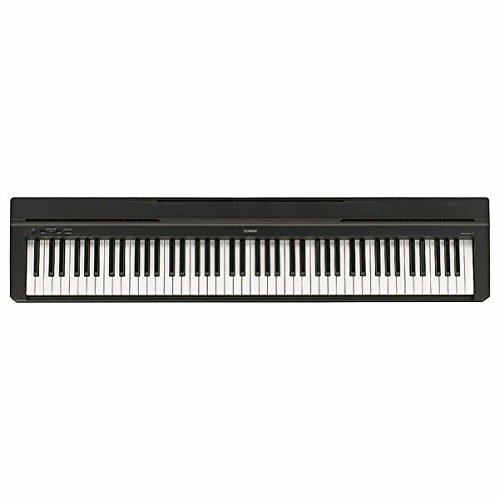 If you liked the last piano but would like to have a couple of different ones to choose between you should check out Casio Privia PX160BK 88key digital piano. It is too very slim and simple and a really good substitute for a real acoustic piano. The 18 different sounds you can choose between are really nice and the speaker system is very good for the price. One of the best things about this piano is that it’s not only available in black, but also in a gold/champagne color which is really cool. This piano can easily be connected to a tablet or computer via MIDI USB. Another great thing about it is that it has a 3-year manufacturer’s warranty, so if something should be wrong with it, it’s all taken care of, which is nice to know. Why We Liked It - Once again we have a piano that is perfect for anybody who really just wants a normal piano and want to be able to turn the volume down and try a couple of different sounds once in a while. It’s compact and easy to bring with you if needed and it takes up little space in an apartment. Check out the Casio Privia PX350 as an alternative. Perhaps you’re a beginner that wants to learn to play at home when you have some time over? With Alesis Recital Pro you get a 3-month premium subscription for interactive online piano lessons, which is good to get you started. This piano has 88 semi-weighted keys and adjustable touch response. It’s also possible to combine two sounds to get some nice layers going. The keyboard can also be split into lesson mode so that a teacher can demonstrate the music in the right octave. If you want to use this piano for recording you can connect it to a computer via USB MIDI. Why We Liked It - This is a well-sounding piano that works for any pianist, really. If you want something basic that does what it says on the box, this is the way to go! Last… and probably least is RockJam. It only has 61 keys and is really an upgrade from a toy piano to something a little more instrument-like. It’s a good piano to buy if you want to see if your kids are interested in learning to play a few tunes, and it has 100 different sounds and 100 rhythms they can play with. 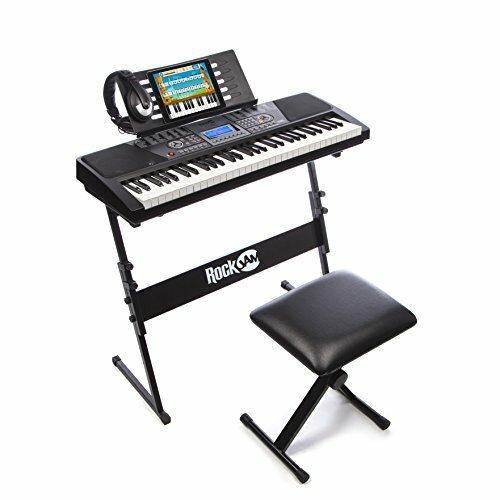 It comes with a stand, headphones, a stool and 30 free songs on the Piano Maestro app for iPad, which is a really good app! Why We Liked It - This piano is for young kids that just want to play around with it. It’s more like a toy than a proper piano. A piano is something that enriches a home. 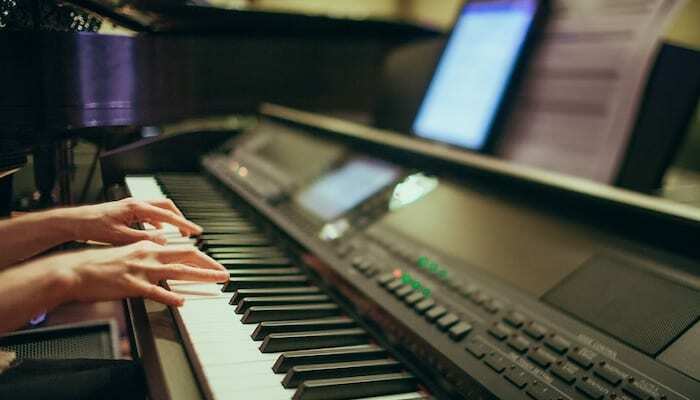 Whether piano is your main musical instrument and you practice every day or you just want to be able to strike a few keys once in a while, it is something that basically every musician needs. But not everybody has room for a big acoustic piano, and many people living in apartments don’t want to disturb their neighbors. 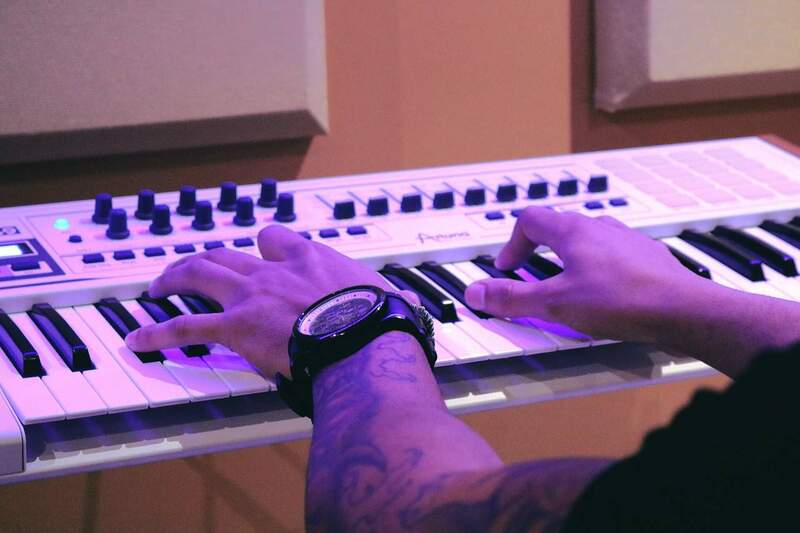 So electric pianos fill an important role in the music world nowadays. We really hope that this buying guide has helped you to find the perfect piano for you. 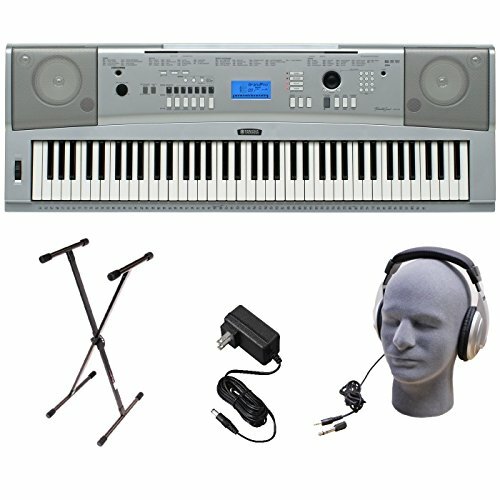 If you still feel like you can’t make up your mind, at least you can now make your own little list to bring to the music shop so that you know where to start, and hopefully you feel a little more educated about what different and extra features the pianos have and what to expect from a digital piano in this price range. Of course, price ranges do fluctuate now and then. 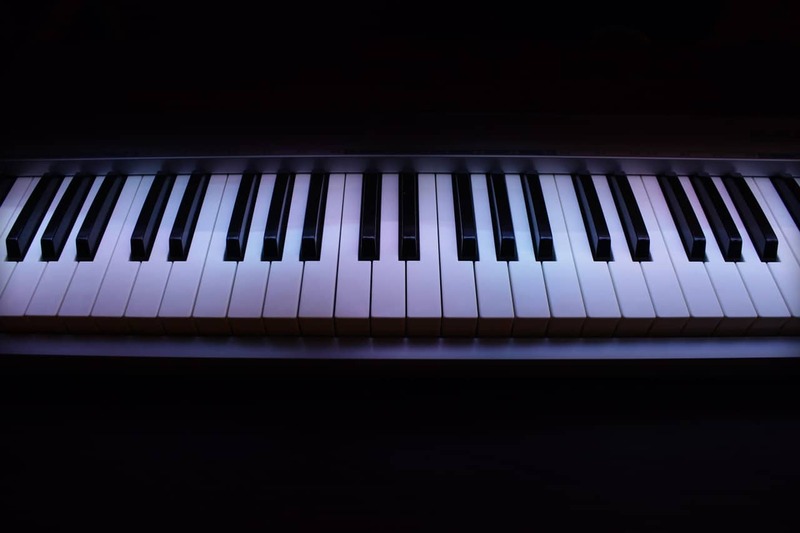 If you are choosing the best digital piano from a couple of pianos, make sure that you look up the YouTube videos we’ve recommended, and also try making your own list of pros and cons and see how it adds up. Another way of making up your mind is having someone else pick, if you’re happy with their choice, then that’s fine. But chances are that when they say “You should go for that one”, you might actually realize that you really liked another piano better. If you feel in your heart that you don’t want to listen to your friend, then you might know what piano to buy! Everybody seems to be looking for different things in their digital piano. A classical piano player would typically look for a musical instrument for music production that has good piano sound, 88 weighted keys and a sustain pedal included, whereas somebody who is more into modern music might feel that it’s important to have lighter keys and many different sounds and effects to choose from, such as reverb and chorus. Take a minute to reflect- why are you buying a digital piano and what extra features do you need? Do you want a light piano to bring with you from time to time or is it just going to sit in one place? How many sounds will you be needing? Do you need to be able to connect it to a computer? How many keys do you need? What brands do you like? These are all questions that will help you determine what kind of digital piano you should be looking for. If you find that it feels like being lost in a jungle without a map, go into a music shop that specializes in 88key digital pianos and asks for some help. The staff will be used to answer the questions you might have and will be able to lead you in the right direction. You don’t have to be embarrassed that you don’t have much knowledge, they get customers like that all the time and probably remember back in the day when they didn’t know much either. Everybody has to learn to play at some point! Many first-time piano buyers wonder how many keys there are on a standard piano. The answer is 88, but you’ll find that some digital pianos have fewer, and portable keyboards almost never have 88 keys. 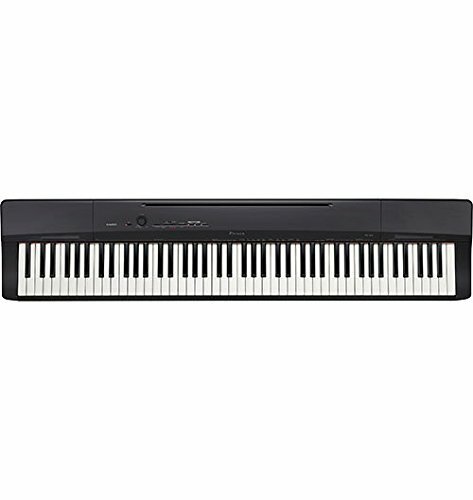 However, 88key digital pianos are a popular choice. Imagine the inside of an acoustic piano. 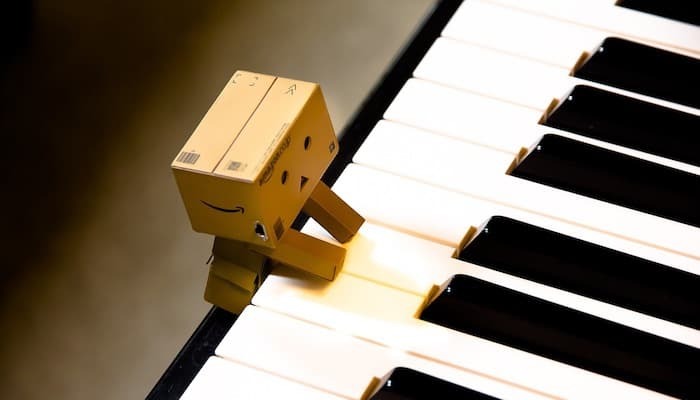 When you strike a key, a hammer will strike strings in the piano, and that’s how the sound and feel of a piano is made. Hammer action simply means that the feeling of this mechanical aspect of piano playing has been imitated, so that playing will feel just like a real piano, even though there are no physical hammers. An acoustic piano’s keys always have some resistance, it’s not just a piece of plastic that is pressed down super easily. When you use your digital piano to play classical music and jazz you will want the experience to be just like playing an acoustic piano. 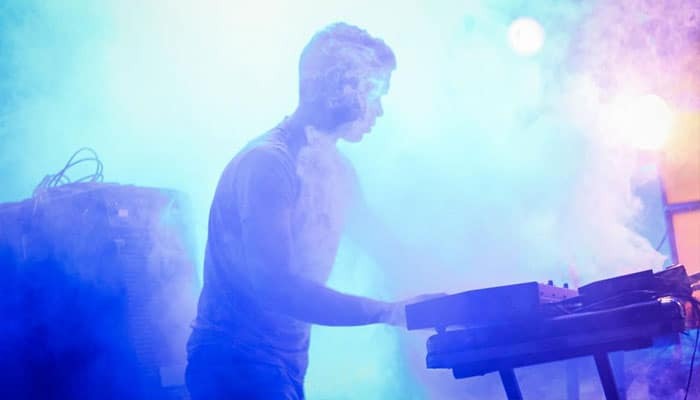 Technically it’s much harder to play advanced music on keys that don’t give you anything back, it’s like playing soccer at a muddy field, it will make everything much harder and less glamorous. If you are buying a used piano, make sure that you try it so that all the keys are working. Just because it’s a digital piano doesn’t mean that everything is always going to function properly! … that piano playing is good for your intelligence? Piano helps you to become better at math and your coordination improves since you are using both hands for different things!